This chapter will provide an overview of how “big data” and “big data” analytics can be brought to bear on the pressing biodefense challenges of: (1) threat awareness; and (2) surveillance and detection. The chapter will also discuss potential problems that can arise by relying exclusively on “big data” approaches, which have properties and limitations inherent in their composition that may not be initially recognized but which may lead to erroneous results. The chapter will conclude by discussing how multi-disciplinary teams of researchers using hybrid systems, involving “big data” and “small data,” could more effectively and accurately contribute to understanding biodefense problems. Achenbach J, Sun LH. Scientists synthesize smallpox cousin in ominous breakthrough. The Washington Post. 2017. https://www.washingtonpost.com/news/speaking-of-science/wp/2017/07/07/scientists-synthesize-smallpox-cousin-in-ominous-breakthrough/?utm_term=.95d61eea13c8. The Commission on the Intelligence Capabilities of the United States Regarding Weapons of Mass Destruction. Report to the President. 2005. https://fas.org/irp/offdocs/wmdcomm.html. U.S. Department of Defense. 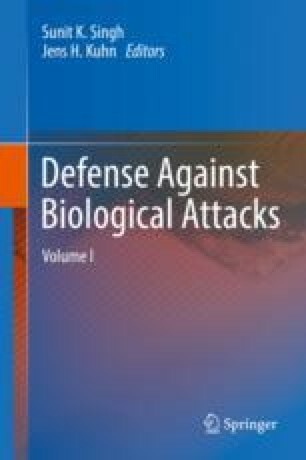 Advances in biotechnology and genetic engineering: implications for the development of new biological warfare agents. 1996. www.acq.osd.mil/cp/docs/reports/biotech96.pdf. Lohr S. How big data became so big. The New York Times. 2012. http://www.nytimes.com/2012/08/12/business/how-big-data-became-so-big-unboxed.html. Manyika J, Chui M, Brown B, Bughin J, Dobbs R, Roxburgh C, Hung Byers A. Big data: the next frontier for innovation, competition, and productivity. The McKinsey Global Institute. 2011. http://www.mckinsey.com/business-functions/digital-mckinsey/our-insights/big-data-the-next-frontier-for-innovation. U.S. General Accountability Office. Biodefense: The Nation Faces Multiple Challenges in Building and Maintaining Biodefense and Biosurveillance, Statement of Chris Currie, Director, Homeland Security and Justice, Testimony Before the Committee on Homeland Security and Governmental Affairs U.S. Senate GAO-16-547T. 2016. http://www.gao.gov/assets/680/676548.pdf. American Association for the Advancement of Science. Federal Bureau of Investigation, and the United Nations Interregional Crime and Justice Research Institute. National and transnational security: implications of big data in the life sciences. 2014. https://www.aaas.org/report/national-and-transnational-security-implications-big-data-life-sciences. De Micheli C, Stroppa A. Twitter and the underground market. 11th Nexa lunch seminar, Turin, Italy. 2013. http://nexa.polito.it/nexacenterfiles/lunch-11-de_michelistroppa.pdf. Arbesman S. Stop hyping big data and start paying attention to long data. Wired. 2013. https://www.wired.com/2013/01/forget-big-data-think-long-data/.